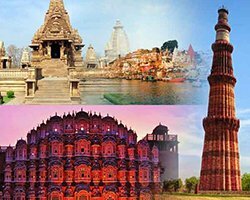 Welcome to North India , the Capital City of India where you can explore with some historical, cultural, religious and heritage sites. This golden triangle package covers the best three cities Delhi, Agra and Varanasi. Its includes Agra the land of Taj Mahal en route stopping at Sikandra to see famous Akbar’s Tomb. Jaipur - the capital city of Rajasthan, en route stopping at Fatehpur Sikri - a world heritage site, enjoy boat ride on the Ganges - India’s most sacred River and much more..
Book with our best tour packages and focus on memories. After the breakfast proceed to Jaipur - the capital city of Rajasthan, en route stopping at Fatehpur Sikri - a world heritage site. Fatehpur Sikri is abandoned city famous for its ancient monuments. It was built by Mughal Emperor Akbar as his capital. But unfortunately the city was abandoned soon due to scarcity of drinking water. Major attractions to see at Fatehpur Sikri include Buland Darwaza (the largest gateway in the world), Panch Mahal, Jodha Bai Palace, Birbal Mahal and Salim Chisti Dargah. Continue to Jaipur - the Pink City of India. Upon arrival in Jaipur proceed to the hotel Reach & check-in at the hotel and relax for a while amidst the comforts of your room. Explore the evening at your own leisure at the hotel. Overnight stay at the hotel. Take an early morning excursion trip to Amber Fort. Amber Fort is a magnificent fortress constructed on the top of a hill in the outskirt of the city. Enjoy battery van ride to ascend the fort complex. Return to hotel en route visiting the palatial Jal Mahal Palace. After enjoying the breakfast proceed for the Jaipur city tour. Jaipur is the largest and capital city of Rajasthan and fondly known as the Pink City of India. Drenched into royal grandeur and glorious past the city of Jaipur is internationally famous for its magnificent forts, palaces, temples and other monuments. Major attractions to see in this city include City Palace Complex, Govind Devji Temple, Hawa Mahal (the Palace of Winds), Jantar Mantar Observatory (world heritage site), Birla Temple, Ramniwas Gardens, and Albert Hall Museum. Explore local bazaars in the evening for shopping. Overnight stay at the hotel. Enjoy the breakfast at the hotel, later proceed Agra the land of Taj Mahal en route stopping at Sikandra to see famous Akbar’s Tomb. Continue drive to Agra. Upon arrival at Agra, you will be transferred to the hotel Reach & check-in at the hotel and relax for a while amidst the comforts of your room. Later proceed to visit Taj Mahal, the seventh wonder of the world and the sign of love. Later visit Agra Fort and local bazaars for shopping. Overnight stay at the hotel. Grab another opportunity to see Taj Mahal at sunrise. After enjoying the breakfast explore the rest of the day with other attractions like Agra Fort (world heritage site), Itimad-Ud-Daulah Tomb (the Baby Taj or Little Taj Mahal) and Dayal Bagh. In the evening you will be dropped at the Railway Station of Agra to board overnight train to Varanasi - the pilgrimage destination of India. Overnight stay at the hotel. In the early morning enjoy boat ride on the Ganges - India’s most sacred River. See the people bathing in the river and offering the prayers to the rising sun. See the unique culture & tradition of Hinduism. See the famous cremation Ghats like Manikarnika and Harish Chandra. Return to hotel for breakfast. Later proceed on Varanasi city tour. Kashi Vishwanath Temple, Durga Temple, Tulsi Manas Temple, Bharat Mata Temple, Banaras Hindu University, etc are major tourist sites in the city. Overnight stay at the hotel.